Doctors at Eatons Hill has a fully equipped Skin Cancer Clinic on site offering both peace of mind and treatment options where applicable. Skin Cancer can present in different forms and regular skin checks are essential for early diagnosis and the best chances of successful treatment. Our reminder system helps you keep track of your skin checks so that you are being regularly assessed by one of our doctors. Slop on a broad spectrum, water-resistant SPF30 sunscreen (or higher). Put it on 20 minutes before you go outdoors and remember to apply it again every two hours after. Slap on a hat a broad brim hat is perfect to protect your face, head, neck and ears. Prevention is the best policy. Slip, slop, slap, seek and slide are your essential guidelines for protecting your skin. In addition to these, when you identify anything on your skin that worries you, a doctor’s check-up should be a priority. Self-examination is important to monitor any new formations on your skin and if there are places you can’t see yourself, you can ask a family member or friend to help. 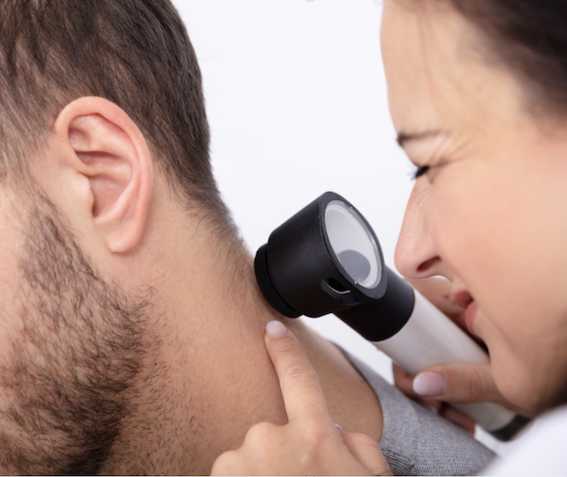 Medical examinations with a dermatascope allows doctors to track any changes of the skin. Minor surgical procedures can be performed in our Eatons Hill practice to remove suspicious formations, which are immediately sent to pathology laboratories to determine their nature and if they are cancerous or not. If there are no cancerous cells, your doctor may look into other dermatological conditions that may be causing your symptoms. If cancerous cells are found, pathology will also identify what type they are (Melanoma, Basal Cell Carcinoma (BCC) or Squamous Cell Carcinoma (SCC)) your doctor will discuss your treatment plan. To book in and be seen by a doctor at our Eatons Hill practice, please click the below and select your time. All skin cancer consultations, treatments and procedures are bulk billed for Medicare and DVA card holders.